Thank God, the Mayans were wrong after all. It is August 2012 as I write this, and the world has not come to an end. At least, not yet. And we here at The Ilocos Times are taking this golden opportunity for a renaissance of sorts. Let’s admit it, while the paper, oldest in this part of the universe, remains the most legitimate paper here, much of what it could, much of what it should be remains unrealized. And it cannot but keep up with the changing times, lest the Mayans be proven right, at least in the case of The Ilocos Times. Newspapers aroud the world are in peril of extinction in this age of Internet and digital boom. Print circulation has suffered as demand for news in real time has forever changed the media landscape. Note that the paper’s ilocostimes.com, which debuted in 2000, was one of the country’s first websites offering local news. The website brought a lot of joy to Ilocanos, especially to those who are in Diaspora beset by homesickness. Somewhere along the way, however, the website faltered, with uploads coming in as sporadic and unpredictable as menopause. Also, in the past half decade, only the paper’s pdf file was being uploaded. Readers would frequently visit the site only to find an outdated issue still posted, and new ones waiting to be uploaded no one knows when. On the first day of Christmas in the Philippines, September 1, all these will change, hopefully. The new ilocostimes.net (take note, dear karikna, it is .net now replacing .com) will serve Ilocanos in better and bigger ways. Expect breaking news, more interesting features, and even more incisive editorials and opinion. Also, the website is linked up with social networking sites like Facebook and Twitter which will allow readers, not only to access, but share information as well. The Ilocos Times Facebook page, which took off barely three weeks ago, now has a weekly reach of over 10,000 netizens. So, it’s Ilocos Sometimes no more, but Ilocos now, Ilocos always, Ilocos all-the-time with the new website. I am now, as I was before, sincerely apologizing for the hurt and disgrace I have caused the institution and I humbly ask for your forgiveness. Since I left the school, I have suffered the consequences of my actions. Life outside the institution has been a series of tribulations. Despite all of these, I am still thankful for the valuable lessons that made me a better person. It was, after all, a learning and humbling experience. I do not wish for the institution to turn a blind eye to the offenses I have made, because it was worth every punishment ounce for ounce, but I appeal here and now for a second chance. With my few remaining units, I am begging you to allow me one semester to finish and finally prove myself to be a worthy Divinian. My education is one of the most important keys I have for a better future and I hope that you would consider my plea. Father, given the chance, I promise anonymity and isolation of myself from other students. I will be willing to undergo tutorial classes and should there be other conditions you have for me to be allowed to enroll again, I will respectfully accept them. Please, Father, I am begging for your compassion and forgiveness. Should my request be granted, I will forever be grateful for the opportunity and chance that will be given to me. The letter, dear karikna, was written by Daryl Velasco, a former student of Divine Word College of Laoag. One of Daryl’s articles in DWCL’s The Williamite, where he was an editor, sparked controversy which led to his expulsion from the institution led by “Father,” the Father President Reynaldo B. Jimenez, SVD. Without going into the merits of the case, let me say at the onset, as Daryl and his lola did in their letters of appeal to “Father” that the institution had every right to impose punishments it deemed appropriate. But while I concede that DWCL had every right in the legal arena, I have doubts whether they stand well in the realm of Christian charity and compassion. I first met Daryl when we were preparing for the Ilocos Norte Debate Cup in 2010. 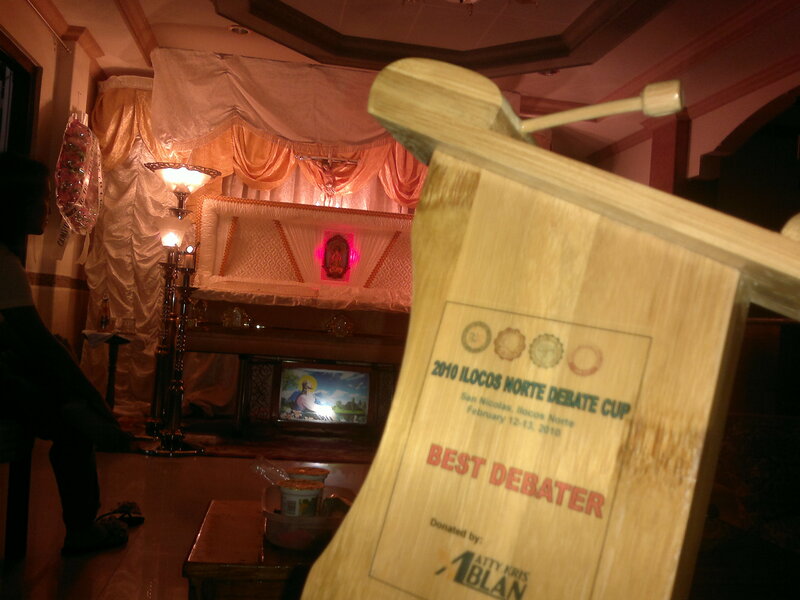 I was one of the organizers and at the same time coach of the MMSU Debate Team. I always tell my debate trainees that if they want to be good debaters, they should not only talk like a debater, but look, walk, and even smell like a debater should. And that was what I saw, heard, and smelled, pound by pound, in Daryl. When I conducted practice debates among students from MMSU, DWCL, and Northwestern University, Daryl was always very receptive to advice, and always worked hard to level up his performance. I knew he really wanted to achieve something. In that competition sponsored by then Provincial Board Member Kris Ablan, MMSU and DWCL eventually fought in the championship round. And which team won? DWCL. And who was best debater? Daryl. Sadly though, same officials were quickest to shoo away this sheep entrusted to them because of mistakes he allegedly committed as a student journalist. And the punishment of expulsion was handed down to him when he only had a few units left and a semester or two short from obtaining a degree in legal management. Meanwhile, the guidance counselor who had a big hand in kicking out Daryl now denies knowledge of the process. I asked myself when I learned about this if such punishment was not too much. Would a one-year suspension not have been enough? What the expelled student found even more difficult was how to relay the situation to his mama who has been working as a house help in Malaysia since he was one year old. This took a very heavy toll on Daryl’s health. His blood pressure often shot up, and he had bouts with depression. In some instances, immediate trips to the hospital were necessary. Daryl, however, chose to suffer mostly in his lonesome while remaining jolly in the company of friends. No debates about it, he was a bubbly, fun-loving, and light-hearted person who was very easy to love. The chubby and diminutive lad was not at all scary off the podium. The smiles and poses in his Facebook photos belie the cruel fate he had to face. Two years out of school, he easily landed in jobs even without a college degree, first in a call center, then at the Laoag City Library as clerk. Last March, he made an appeal to “Father” coursed through Mrs. Bitancor, hoping that the school would reconsider. Daryl’s Lola Taciana who took care of him since childhood also wrote a moving letter, in Iluko and handwritten, humbly begging for Father’s mercy and forgiveness. Our dearest Daryl died of heart attack last week, Aug. 15, at age 23. His finest comrades in debate and writing, from various schools, paid tribute to him last Sunday. I have never, dear karikna, seen public speakers and journalists so lost for words. The family said they refused a wake service offered by DWCL, and for obvious reasons. NO, she did not wear a neck brace, and, no, she was not out on bail. It was the better Gloria I have previously written about who joined Ilocanos, mostly young people, at the foot of Gilbert Bridge last August 6 for a candle lighting ceremony in support of the Reproductive Health Bill. It was a crucial moment for the controversial piece of legislation which has stagnated in Congress in the last one and a half decades, no thanks to the opposition of the Roman Catholic Church hierarchy. (I have to say “hierarchy”, dear karikna as all national surveys say a great majority of Filipinos, the Catholic faithful included, strongly support the RH Bill.) Congress was to vote whether to proceed with the prolonged and circular debates or to terminate the interpellations and push for the bill’s second reading in the Lower House. It was a crucial moment, and the significance of the activity was not lost on Gloria Portela Valencia, 55. Taking time off from her many chores as a house help in Laoag City, she joined well-meaning citizens, composed mostly of young people, in the silent activity for the RH Bill. Frail and shy, Gloria came in a red shirt she usually wears when attending mass. She lit a candle, stood there, and joined the group in the brief gathering. But Brigette Mayor, a field reporter of GMA’s Balitang Ilocos noticed Gloria among the crowd and interviewed her. “Manang, apay supsuportam ti RH Bill?” asked the young journalist who may have been expecting a generic answer, but hit a pot of gold in her interviewee’s moving response. Gloria hails from Barangay Bacsil in Dingras town. Manong Rolando, her “First Gentleman,” is a tobacco farmer who tills less than a hectare of land that is not theirs. The eldest among her siblings, she started working as a kasambahay at age 13. When she got married and bore kids, this devoted mother quit her job and stayed home to take care of her growing family. She gave birth to six kids. Eight years ago, however, when two of her daughters started going to college, Manang Gloria decided to stage a comeback as a househelp so she can help send them to school. A few years ago, Gloria’s world crumbled when she found out that one of her daughters, already in third year college, got pregnant by a married man. When that happened, she could not sleep at night though tired from the day’s work. She would stare blankly at nothingness, mulling why things went wrong. She did her part, she sacrificed, she prayed hard, but why? Two months after, as if her troubles were not enough, this mother discovered that her other daughter, also in her junior year in college, was pregnant, too. Both of her girls had to quit school to take care of their young, and Gloria was totally devastated. But my dear Alma Mater shocked the nation last week with reasons other than peace. Marc Andrei Marcos, a freshman law student, died in initiation rites under the bloody hands of men he wanted to be his ‘brods’. The incident, which happened in a farm somewhere in Dasmariñas, Cavite, was believed to have been participated in by over thirty members of the Lex Leonum Fraternity. Marcos, black and blue in various parts of his body, was brought to the hospital not by his would-have-been brods, but by two farm helps. 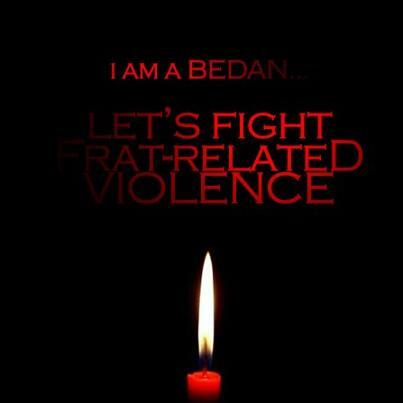 What aggravates the nation’s grief and fury is that only five months ago, another Bedan law student, Marvin Reglos, suffered the same fate under the Lambda Rho Beta fraternity. As expected, CHED chair Patricia Licuanan condemned “in the strongest terms” the death of Marcos. She reminded the college of its “heavy responsibilities and duties under RA 8049 or the Anti-Hazing Law.” Other schools, particularly the UP and the Ateneo, have also had similar episodes of fraternity violence, each time fueling public uproar but only to be forgotten after the issue subsides, no thanks to the Filipino’s short-term memory coupled with the ningas-cogon vice. Meanwhile, administration lawmakers urged CHED to enforce a strict “no-hazing policy” in schools as the Filipino people mourn for the death of yet another young man who had a full and bright life ahead. Before admission to San Beda, I had to sign a contract stating that I could be expelled if the college finds out I am a member of any fraternity. I really did not find any need to join one. Among most active student leaders in my batch, I did not lack belongingness nor self-esteem. But then I was in undergraduate San Beda. I knew our law school was different; joining fraternities there are more of norm than exception They hold activities in the open and display banners bearing their groups’ Latin names even in interschool activities like bar operations. Today, San Beda reportedly bans fraternities in law school though I doubt if administrators seriously believe it is possible. Banning fraternities or hazing, however, is only a part of the solution. Making it less appealing is the more difficult task. An aspiring lawyer perceives membership in a fraternity as ticket to legal success. The exclusivity and influence of a group proves beneficial not only in ensuring survival in law school but even more when one has become a lawyer who finds connections handy in cases he handles (e.g. when the judge is one’s brod). Having passed the initiation, after risking life and limb, the neophyte becomes a full-fledged member of the fraternity, part of the old boys’ network. “The pain lasts a few days, but the perks are forever,” this explains the resilience of hazing as a law-fraternity practice despite RA 8049. In 2010, Jejomar Binay credited his vice presidential success to the support he got from the Alpha Phi Omega. In one episode of the impeachment trial of Renato Corona, widely watched by aspiring lawyers, fraternity prestige was proudly displayed by the senate president himself. When Rep. Raul Daza stood up to introduce himself as prosecutor, Presiding Senator-Judge Juan Ponce Enrile formally acknowledged him, and fondly called him “brod.” Enrile then quickly turned to the senior defense counsel, Serafin Cuevas, and likewise referred to him as “brod.” Broadly smiling, the venerable defense lawyer impishly nodded to the chair, and forthwith called out the other “brods” among the senator-judges – Senators Edgardo Angara and Franklin Drilon. Public officials cannot in good conscience condemn fraternity violence while becoming poster boys, wittingly or otherwise, of these barbaric groups. We are in dire need of statesmen like former Senator Jovito Salonga who in 2007 resigned from his fraternity, Sigma Rho, which was implicated in the death by hazing of a UP student. Any politician who does a Salonga today deserves our vote. Until then, ‘pax’ would remain as elusive as justice is in this country where lawyers turn liars propagating the fraternal mystique. Obviously, fratmen were unhappy with it, and even before the school paper was circulated, the picture in my column was defaced in almost every copy, with the permission of a security guard who turned out to be their supporter. Alarmed, people began warning me about possible danger. But I was not afraid. Then one afternoon, in a street adjacent to the campus’ main building, four teenage boys suddenly circled me as I was walking home. With my head locked in the muscled arms of a gangster, my face was on the receiving end of powerful jabs. While I tasted blood dripping from my nose, I saw nothing but black, except stars and twittering birds circling my head (the kind of which I thought only appeared in cartoons). I was a helpless punching bag until members of the Samahang Ilocano came to the rescue. They shooed away my attackers. I was thankful to S.I., of course. God knows what more injuries I could have sustained if they did not come. Yes, I was grateful, but only until I figured that the four action stars were their brods from INNHS, a nearby school. All of them arranged the plan so that I would have a debt of gratitude to them. Bravo. A couple of months after, a riot erupted in the campus, killing one student and injuring a security guard. Only then did administrators ban fraternities on campus.